Click here to see annotated image of the positions of the planets> and stars. Stonehenge, four thousand year old monument to the Sun, provides an appropriate setting for this delightful snapshot of the Sun's children gathering in planet Earth's sky. While the massive stone structure dates from around 2000 B.C., this arrangement of the visible planets was recorded on the evening of May 4th, 2002 AD. Bright Jupiter stands highest above the horizon at the upper left. A remarkable, almost equilateral triangle formed by Saturn (left), Mars (top), and Venus (right) is placed just above the stones near picture center. Fighting the glow of the setting sun, Mercury can be spotted closest to the horizon, below and right of the planetary triad. Still easy to enjoy for casual sky gazers, this photogenic and slowly shifting planetary grouping was joined by a young crescent Moon beginning Monday, May 13. 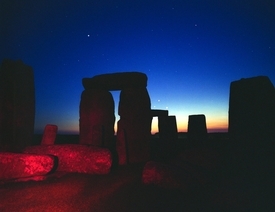 The planetary conjunction of 2002 was recorded on the night of May 4, 2002 from the 4,000 year old astronomical temple of Stonehenge. Jupiter can be seen above the left-most sarsen of the central trilithon. The triangle of Mars, Saturn and Venus can be seen in perfect symmetry above the western lintel, with Mercury immediately to the left of the adjacent sarsen.